Will Rs 1.48 lakh crore Capex help railways to become safer? As the government allocates Rs 1.48 lakh crore for the railways for 2018-19, it is expected that this would improve safety and create better infrastructure. The railways got the Capex of Rs 1.31 lakh crore with the gross budgetary support of Rs 55,000 crore in the last budget. However, despite the creation Rashtriya Rail Sanraksha Kosh (RRSK), having corpus of Rs 1 lakh crore by the centre in 2017 budget, number of accidents remain a major cause of worry for the railways. Around nine major train accidents happened in 2017 in which 70 people lost their lives. Though the railways vehemently claims that it has been successful in reducing accidents, the last year’s several mishaps expose the hollowness of the railways’ claim. According to the railways’ February, 2015 white paper, as much as 40 per cent of 1,219 line sections are utilised beyond 100 percent. It itself shows that traffic on certain sections has increased massively and the railways is slow to expedite doubling of tracks. The railways need more funds despite the fact that it is able to spend only around 50-55 percent of its planned capital expenditure in the last fiscal. 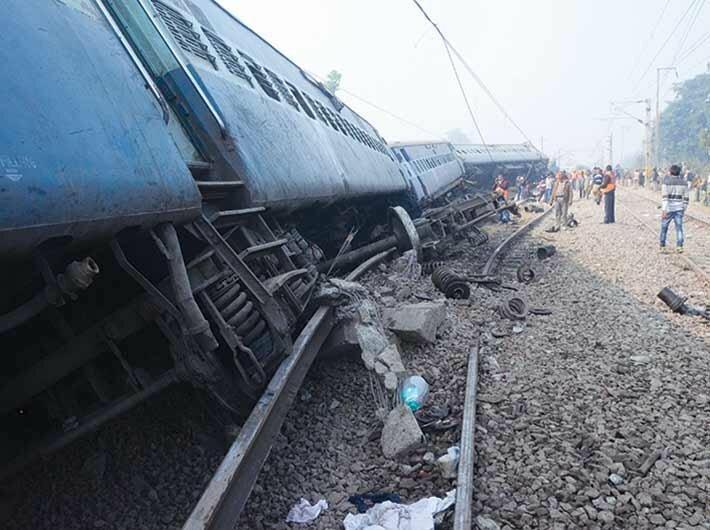 A former railway official says the only major thing that happened in the last three years is removal of the then chairman of the railway board AK Mital and railway minister Suresh Prabhu after a string of accidents in August, 2017 in which several people were killed. The railways need around Rs 40,000 crore for elimination of unmanned level crossings (ULCs), construction of road over bridge, road under bridge and low height subways to prevent accidents at level crossings. For track works including maintenance, the railways require Rs 30,032 crore from the government. The said works are needed to be carried out to ensure no major accident takes place. Finance minister Arun Jaitley on Thursday said that 4,267 ULCs to be eliminated by the railways within two years which seems to be an uphill task for the railways. It is still unknown how much funds would be given to the railways for this work. In order to reduce congestion on its network, the railways commissioned 1,528 km of broad gauge lines in 2009-14, 2,828 km in 2015-16 and 2857 in 2016-17. It has planned to commission 3,500 km of broad gauge lines in the current fiscal. Besides, to ensure cleaner environment, the national transporter has also planned electrification of 4,000 kms in 2017 FY, the biggest ever electrification target so far. Infrastructure works like redevelopment of 600 stations, commercial development around stations, high speed and semi-high speed trains, installation of CCTVs in trains, manufacturing German technology LHB coaches and production of train sets and locomotives are some of the other highlights of the 2018 Budget. An official said that railways need to lay new tracks, strengthen maintenance of old tracks and focus on doubling the tracks to prevent major accidents.